The courtyard house is one of the most enduring architectural forms, transcending regional, historical and cultural boundaries. Its balance of simple appropriate construction, environmental control and social and familial structures continues to engage architects and architectural historians. The emphasis on courtyard in Islamic architecture gave it the name of the "architecture of the veil", because it focuses on the inner spaces (courtyards and rooms) which are not visible from the outside. Courtyard housing is an architectural device with a long history first appearing in the buildings of Syria and Iraq three millennia ago. Arab nomads first made use of the concept of a courtyard during their travels and stay in the desert. They set up their tents around a central space, which provided shelter and security to their cattle. 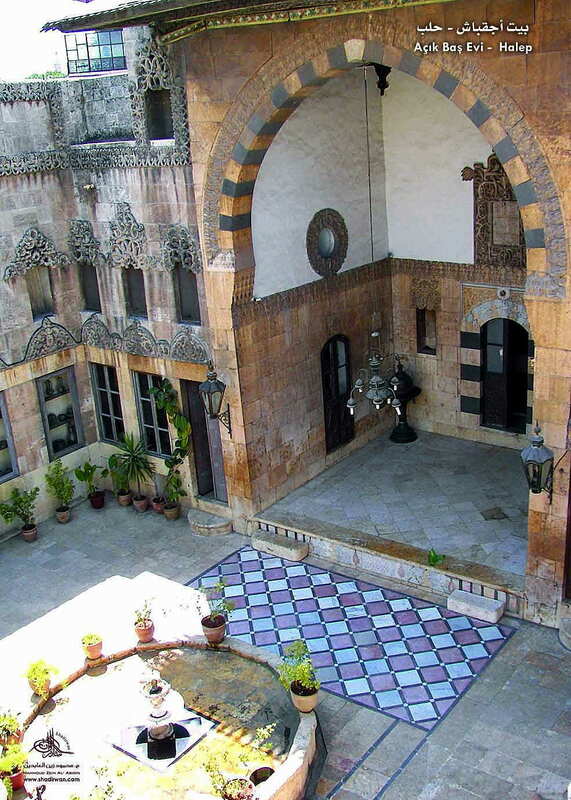 With the development of Arab-Islamic architecture, the courtyard became an essential typological element. It is likely that the previous nomadic desert lifestyle of Arabs had a strong influence on their permanent houses. The courtyard therefore fulfils a deep-rooted need for an open living area. 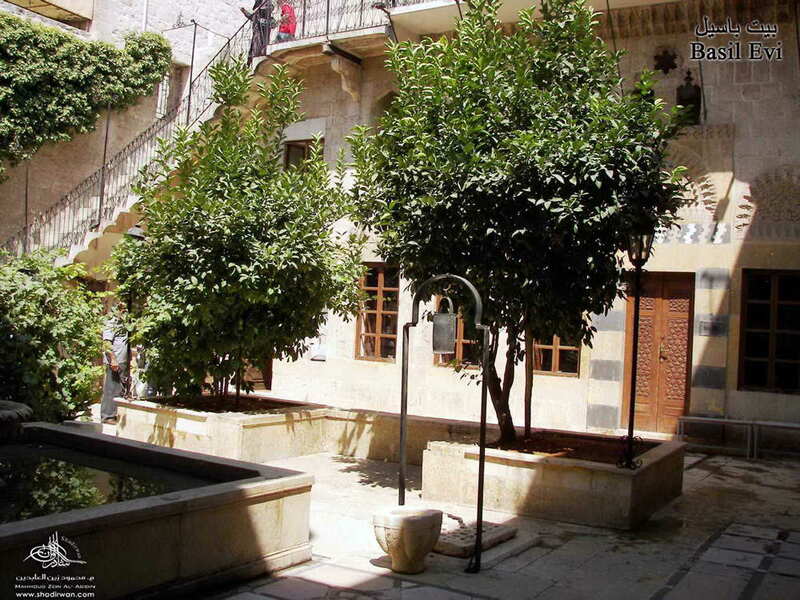 This article describes the typology of the Syrian courtyard house, and presents a number of examples of courtyard houses in Aleppo. 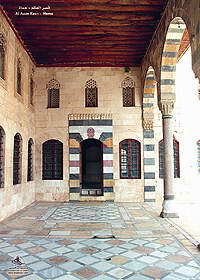 Figure 1: The Al-Azem Palace in Hama. Photo taken by the author. Courtyard housing dates back to the beginning of the third millennium before common era when it appeared in the buildings of Bilad al-Sham and those of the region between the two rivers Tigris and Euphrates. Arab nomads made use of the concept of a courtyard during their travels and stay in the desert. They set up their tents around a central space, which provided shelter and security to their cattle. With the development of Arab-Islamic architecture, the courtyard became an essential typological element. It is likely that the previous nomadic desert lifestyle of Arabs had a strong influence on their permanent houses. The courtyard therefore fulfils a deep-rooted need for an open living area. 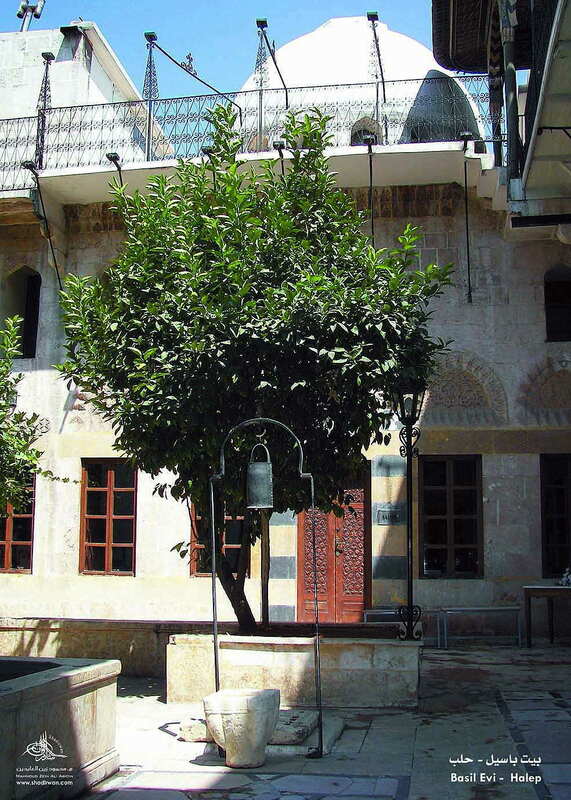 The following article describes the typology of the Syrian courtyard house, and presents a number of examples of courtyard houses in Aleppo. A first floor comprising the private areas called Al Haramlek. Figure 2: The Courtyard of Al-Azem Palace in Hama. Photo taken by the author. The basement floor enjoys an even temperature throughout the year. It is therefore an attractive living space in periods of extreme winter or summer temperatures. The basement acts as a thermal moderator during the hot dry season, as it allows the hot air collected by the wind-catchers to be cooled and humidified before it is released to the courtyard space. It is also used for the storage of annual food supplies as is the case in many courtyard houses of Aleppo, a city that endured many wars. 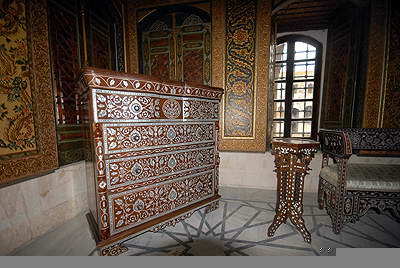 Figure 3: The furniture in main room of Al-Azem Palace in Hama. Photo taken by the author. The houses are usually accessed through a modest space leading into a spacious and beautifully landscaped courtyard. The entrance door consists of one or two wooden door-leaves, reinforced with lead plates fixed with steel nails. The small size of the external doors represents modesty, which is also demonstrated in the lack of decorations of the external windows. It is very difficult, therefore, to judge the level of wealth or poverty of the houses from their external appearance. The entrance door usually leads to a narrow passageway at the end of which another door or curtain filters the entrance to the courtyard, allowing this latter to be totally private and visually inaccessible from the outside, even if the entrance door is left open, which was frequently the case as the old city neighborhoods used to enjoy a high level of security. Figure 4: The furniture in main room of Al-Azem Palace in Hama. Photo taken by the author. The transition from the outside to the inside is marked by a contrast in spatial experience, from a modest and sometimes austere entrance to a highly decorated internal open courtyard with a central fountain (and sometimes a well) and beautiful facades. 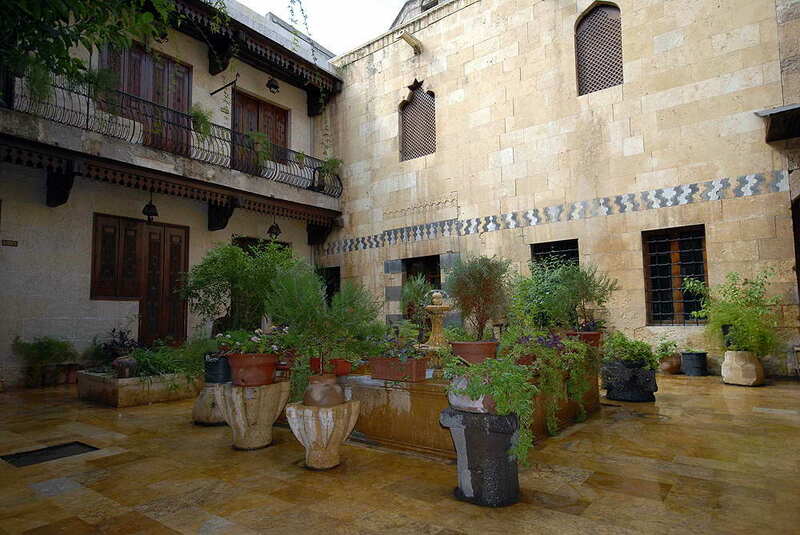 Landscaping also plays an important role in the courtyard of the traditional Syrian house. It consists of two main categories: decorative planting such as climbing jasmine and rose bushes, which add color and scent to the courtyard atmosphere, and citrus trees such as orange and lemon. The facades of the internal courtyard are highly decorated with intricately woven geometric patterns and shapes. 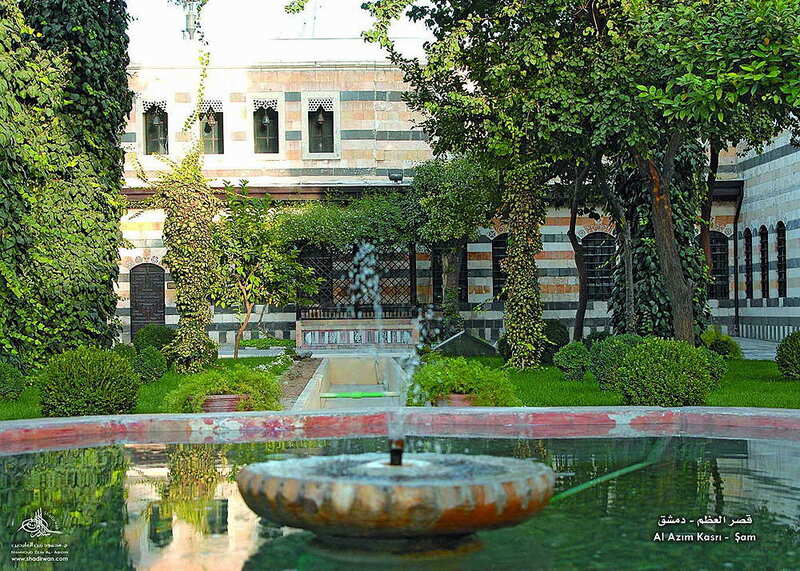 Figure 5:The fountain in Achik Bash House in Aleppo. Photo taken by the author. The iwan is an important covered open apace from which the aesthetic qualities of the courtyard can be enjoyed. It provides a raised platform (by one or two steps), used as a pleasant and comfortable open air reception and seating area and a venue for evening events such as the playing of traditional music. The iwan is usually located on the north façade of the courtyard to catch the cool breeze during the summer. The iwan comprises two symmetrical rooms facing each other and has an ornamental front stone arch facing the courtyard. The transition from the courtyard to the iwan space is marked by a multicolored marble patterned floor, which resembles an oriental carpet. Facing the iwan is the main guest reception hall - used for special ceremonies and festivities such as Eid. This hall is the most decorated space in the house and contains the best items of furniture. 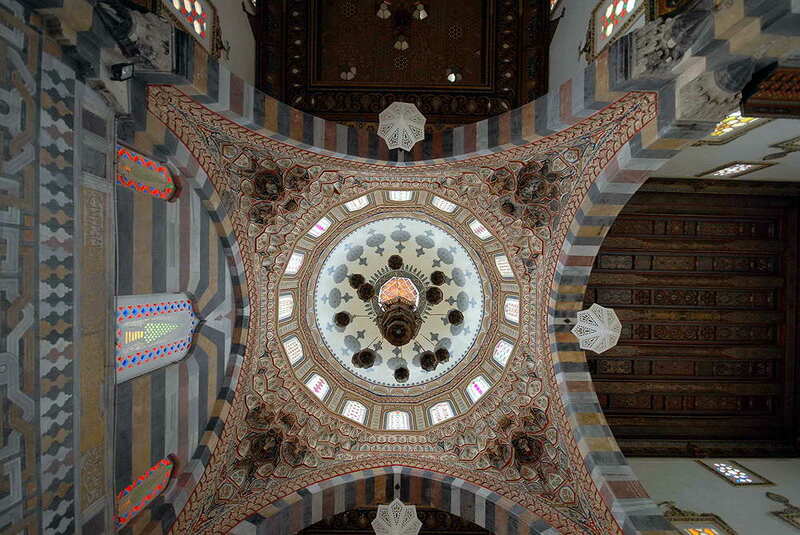 In some houses, such as the Wakil, Basil and Ghazali houses in Aleppo, the main guest hall is covered by a dome. 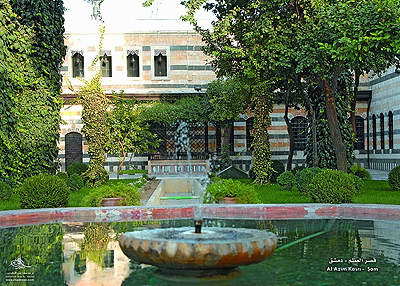 Figure 6: The fountain in Al-Azem Palace in Damascus. Photo taken by the author. In addition to the iwan and the reception areas, the ground floor also contains the kitchen and toilets. The first floor is called the Haramlek. This is a word of Turkish origin meaning a women's section in the house. The living and sleeping areas are totally segregated. The access from the ground floor to the first floor is through a staircase located in the courtyard. Small apartments can sometimes be found on the first floor, particularly in the case of extended families. The first floor can also contain some terraces, allowing the sun's rays to penetrate the courtyard. These provide useful open spaces for sleeping or sitting during the evenings of the hot seasons. The roof spaces are usually well protected by high parapet walls, providing adequate privacy. Figure 7: Basil House in Aleppo. Photo taken by the author. The Mushrabiya is a wooden balcony located on the outer façade of the house. It provides a cool screened space for women, allowing them to view public spaces without being seen. It is usually supported by two cantilevered wooden beams, which are anchored in the external wall. The windows are divided into two types: those located on the external façade of the house and those located on the courtyard facades. Because the house is inward looking, the external façade windows are small, plain and located from the first floor onwards in order to avoid being overlooked by pedestrians in the narrow public streets. The courtyard windows are much larger and are more decorated, providing light and ventilation to the rooms. The ground floor window located inside the thickness of the wall and a wooden shutter is positioned to the outside of the wall thickness. Other types of windows can be found at the base of the courtyard. They are small and arched with no decorations and provide light and ventilation to the basement floor. The doors of the ground floor rooms are two-leaf wooden doors with a minimum of ornamental carvings, the first floor doors are, however, relatively undecorated. In the main reception hall, wall cabinets built-into the thickness of the walls are used to display ornaments such as intricate wooden ornamental carving. The walls around the cabinets are sometimes covered with wooden panels with calligraphic carvings matching the cabinet design. 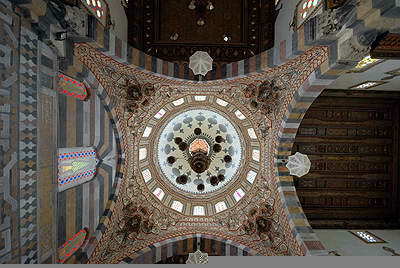 The ceilings are also highly decorated, with wooden panels displaying intricately linked ornamental geometrical shapes. This is particularly the case in the main reception hall, where the ceiling is the highest in the house and consists of intersecting wooden panels with rich carving and gold-plated designs. Symmetry plays an important role in the composition of the ceiling decorations. Figure 8: Basil House in Old Aleppo. Photo taken by the author. Geometric patterns derived from the combination of circles, squares, rectangles and triangles. The geometric patterns are formed by multicolored stone inlays and intersecting timber slats and from floor and ceiling decorations. They are most evident in the floors of the main reception hall, the iwan and the courtyard area in front of the iwan. 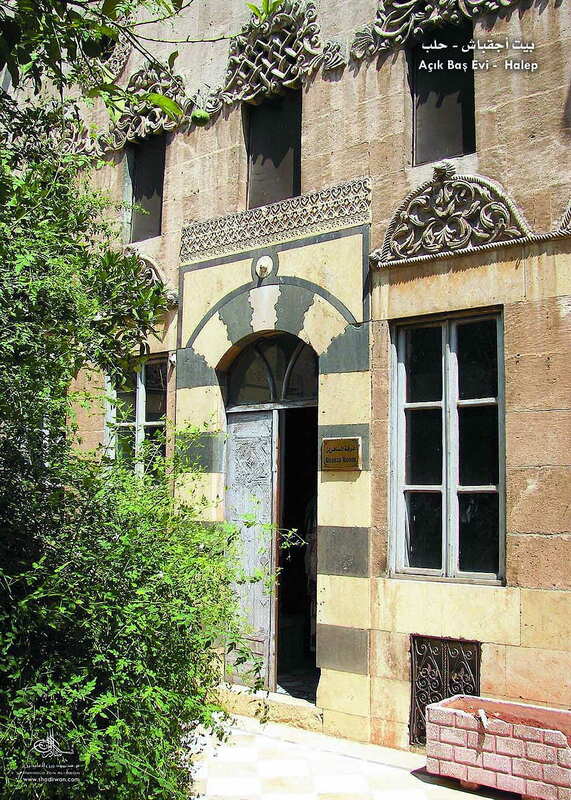 Figure 9: Achik Bash House in Aleppo. Photo taken by the author. The courtyard organization is appropriate to hot dry climates because it maximizes shading and allows for the creation of a pleasant microclimate. The availability of plants and a water feature within the courtyard helps in cooling and humidifying the internal atmosphere. The construction technique, which is based on thick load-bearing stone masonry, provides adequate thermal mass. The existence of cooling towers allows for good summer ventilation as hot air is funneled down into the basement, where it is cooled and let out into the courtyard space. The narrowness of the external streets and passageways leading to the houses also helps in creating a cool and shaded outdoor environment. 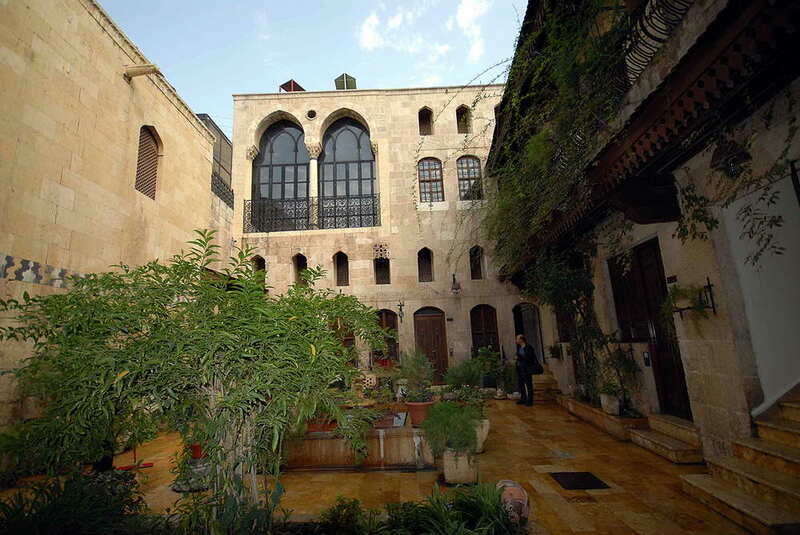 As previously discussed, all Syrian courtyard houses share a humble external appearance. However, their size and level of internal decoration depends on the wealth of the occupying families. Three categories can be identified: large courtyard houses of rich families, medium-sized houses of traders and craftsmen and small and humble houses of the workers. Figure 10: The iwan of Al-Azem Palace in Damascus. Photo taken by the author. The building materials locally available have greatly influenced the construction and shape of the Syrian courtyard house. The abundance of stone in the area made it the main building material in the construction of the courtyard houses of Aleppo. 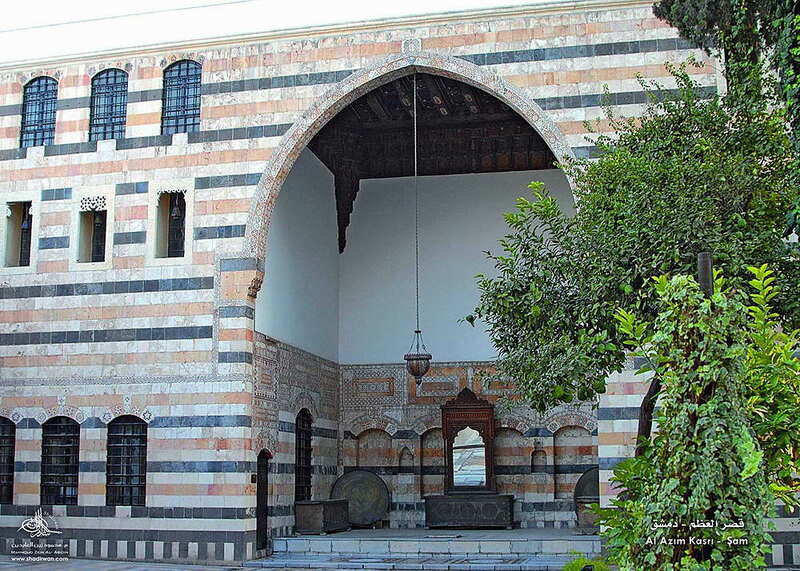 Walls are frequently formed by layers of white and black stones called Al-Ablaq which forms a distinctive characteristic of the courtyard houses of Syria. 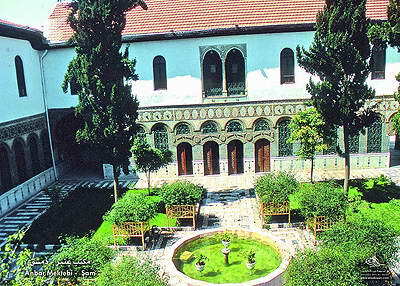 Figure 11: The Maktab Anbar in Damascus. Photo taken by the author. 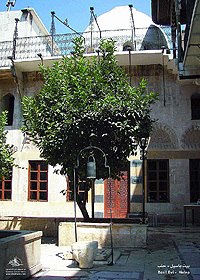 Figure 12: The iwan of Achik Bash House in Aleppo. Photo taken by the author. 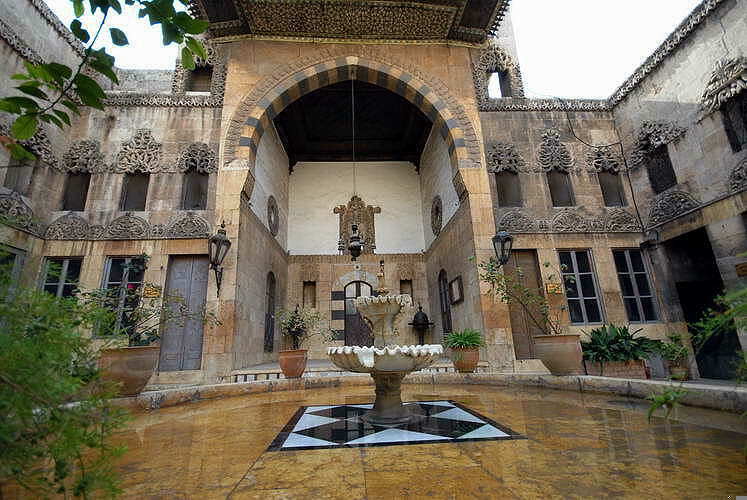 Social, cultural and religious factors have played an important role in the shaping of the courtyard house in Syria. The need for privacy has had a paramount influence on the internal organization of spaces and the treatment of the entrance, the external windows and the separation between family and guest areas within the house. Furthermore, the extended family structure has meant that the Syrian courtyard house was organized with the possibility of semi-independent subunits functioning independently but still maintaining strong family ties. Entertaining guests and relatives was and is still important in the lives of Syrian families. Thursday weekly courtyard parties were very common. Guests were invited for dinner and were entertained in the courtyard with folk music bands. Female parties were also very common and took place on a weekly basis, strengthening both family and neighborly ties. The decrease in family size, with more women working outside the home. The change from the extended family structure to the nuclear household type. 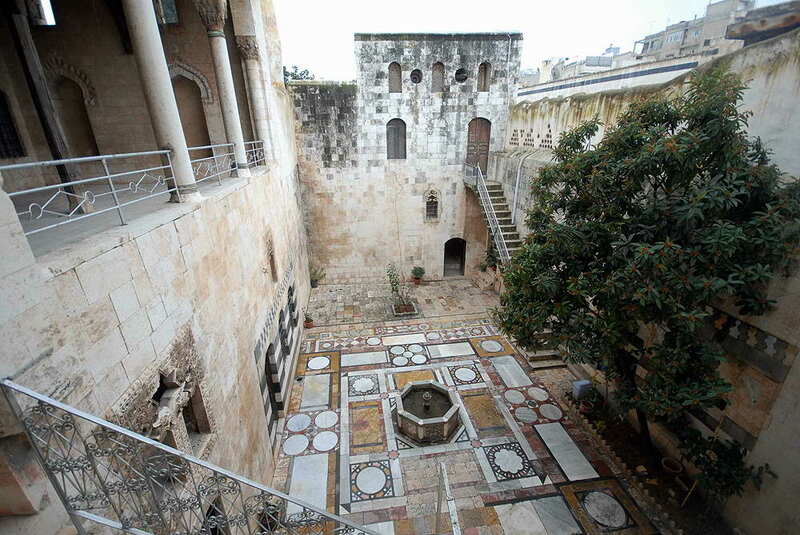 Figure 13: The Courtyard of Al-Wakil House in Aleppo. Photo taken by the author. Furthermore, most families rely on multi-storey apartments as an affordable housing solution and cannot afford large courtyard houses. The Arabic house with its internal courtyard has become rare and has almost completely disappeared in contemporary architecture. So how are we to live in a rapidly-changing world where all meanings of family tradition and culture have changed dramatically? Is there a scope for a new affordable housing typology based on maximizing the benefits of a courtyard organization and responding to the needs of small contemporary nuclear households? Figure 14: The fountain of Courtyard of Al-Wakil House in Aleppo. Photo taken by the author. Amini, Mousallam Sakka, "Islamic and Japanese Traditional Houses and Their Social Meaning: A Comparative Interpretation", Islamic Quarterly, vol. 37, 4, 1993, pp. 266-79. Azab, Khaled, Residential Architecture in Islamic Civilization, Journal Islam Today, N° 25, 1429 H/2008. Bahnassi, A., 'Aleppo', in The Islamic City, edited by R. B. Serjeant. Paris 1980. Dunham, Daniel, "The Courtyard House as a Temperature Regulator," The New Scientist, September 8, 1960, pp. 663-66. Ferwati, M. Salim, and Mandour, M. Alaa, "Proportions and Human Scale in Damascene Courtyard Houses," in ArchNet-IJAR: International Journal of Architectural Research, vol. 2, issue 1 (2008). Holod, Renata and Darl Rastorfer, "Courtyard Houses", in Architecture and Community, edited by Renata Holod and Darl Rastorfer. New York: Aperture, 1983. Ibrahim, Abdelbaki Mohamed, "Historical Evolution of the Courtyard in Architecture", in Alam al-Bina (Cairo: Center for Planning and Architectural Studies), vol. 10-13/204, 1998. King, David A., "Architecture and Astronomy: The Ventilators of Medieval Cairo and their Secrets," Journal of the American Oriental Society, vol.104, 1, 1984, pp. 97-133. Maury, Bernard, André Raymond, Jacques Revault and Mona Zakariya, Palais et maisons du Caire. II: Epoque ottoman (XVIe-XVIIIe siècles). Paris: CNRS, 1983. Rabbat, Nassar, The Courtyard House: From Cultural Reference to Universal Relevance. Ashgate, in association with the Aga Khan Program for Islamic Architecture (forthcoming in August 2010). Sauvaget, J., and Ecochard, M., Les Monuments Ayyubides de Damas. Damascus 1938-50. Scudo, Gianni, "Climatic Design in the Arab Courtyard House", in Environmental Design: Journal of the Islamic Environmental Design Research Centre vol. 1-2, 1988, pp. 82-91. Tabbaa, Yasser, "Towards an Interpretation of the Use of Water in Islamic Courtyards and courtyard Gardens," Journal of Garden History, vol. 7, 3 (1987): pp. 197-220. Susan Roaf, "The Windcatchers of the Middle East," in Islamic Architecture and Urbanism, edited by Aydin Germen. Dammam, Saudi Arabia, 1980, pp. 257-68. * Mr. Mahmoud Zein Al Abidin, Architect - Chairman of Shadirwan Center for Architecural Heritage in Syria.